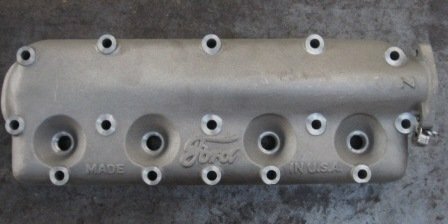 The reproduction Z head, would have to be one of the most popular performance improving accessories used on the Model T Ford. The compression ratio in a Model T was originally set low (4.5:1) due to the low octane fuel available in its day. The Z head raises the original compression ration to 6:1 and by today's standards is still very conservative. It's trough-style combustion chamber swirls the fuel-air mixture, this helps to assure a more complete combustion of the mixture and therefore increased performance. Compare this chamber shape to that of the original design. You can see how the Z head, compared to the standard Model T Ford engine head has a deeper chamber and areas that because they are not smooth, help create a swirl pattern as the air/fuel mix is drawn in past the contours. These appear a little like "pinches" in the surface just below the spark plug hole to the left and right in the Z head image. The Z head does not provide the T with "neck snapping" performance, but rather a more responsive throttle and constant "lugging power". So why would I bother? Well it's when you come to the hills and head winds that the Z head comes into its own. The new head transforms the car in hilly country. Where a standard T drags itself up a hill, or worst, has to be dropped to low gear and effectively walking pace, the Z head car just keeps powering on. I can vouch for the benefits. Owning a '27 model Shooting Brake with a solid hardwood framed back, my car is what you might call on the heavier side of T models. I fitted a Z head about 3 years ago and have never looked back. I often find that I have to throttle back as I start to chase up the back of standard cars as soon as the road gradient changes. In our recent rally to the gold mining town of Walhalla we encountered one of the steepest climbs around, Mt Baw Baw, the last 6.2km's (3.8 miles) of which rises 718 mtrs (2355 ft) at an average gradient increase of 11.5%!! Needless to say, we were all in low gear pushing the pedal through the floor. But where the standard cars (one even with a Ruckstell) were literally crawling up, I and other Z cars in the group powered up, overtaking the slower cars easily. Well actually, one, a Centredoor had to reverse up, but that was the fuel not getting through because of the steep angle! In my opinion it would have to be one of the best value bolt on performance enhancing accessories around for the T. It also has the added bonus of being made from heat treated aluminium and is therefore a lot lighter than the original and also has greater water jackets and therefore better cooling than the standard head. As you can see in the photo's on the above page, the Z head appears to have a very similar pattern to the Haibe and Giant heads with some minor differences. The beauty of the Z head is that it looks almost stock, with only the "Z" cast at the water outlet neck the giveaway. With a coat of engine enamel, no-one would ever know! Best of all, it's available brand new! If you'd like to request a pdf version of the Z Head installation instructions, just fill out the request form here and we'll email you one.